We and customers, he often encountered in steel sheet piles construction encountered many problems, here is our combined steel sheet piles hundreds of customers to cooperation summed up the most representative of the construction problems that need attention, we hope to help to everyone. 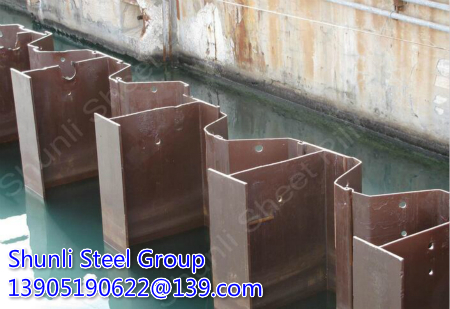 1, sheet piles along the axis tilt is large, shaped pile corrections shaped pile is at the top than the standard width of the sheet stack is usually a wider width is greater than or less, according to the steel sheet pile can be shaped according to the actual welding process tilt; tilt it can also be used when the extent of small winch or hoist ropes and then back to the pile hammer. 2, piling process will encounter large stones or other unknown obstacles, resulting in driving sheet piles deep enough, use curved corners or around obstacles pile pile. 3, steel sheet pile cross section [Other prone to take the following corrective actions in different sizes transverse compressive deformation rock filling the extrusion process: In the case of the deflection position, pull the sheet pile l.0m~2.0M, and then down into a hammer so pull up and down many times the vibration, the vibration may be a stone crusher, or if it is displaced, so that the steel sheet pile position is corrected to reduce the inclination of the steel sheet pile. 4, softer, based on the construction will sometimes occur when stacked adjacent to the phenomenon, is used to measure the number of adjacent posts welded together and coated playback when connected butter locking facilities and other lubricants to reduce the economic pile drag. U-shaped cold-formed steel sheet pile, Z-type cold-formed steel sheet piling, wide hat cold-formed steel sheet pile, wave-shaped steel sheet piles, H-shaped steel sheet piles, steel pipe piles, hot-rolled and cold-formed locking connector, etc., each face kinds of engineering and customer can provide the best cost-effective SL series.